Stretching is a real talk about subject due to its link with physical health and fitness. 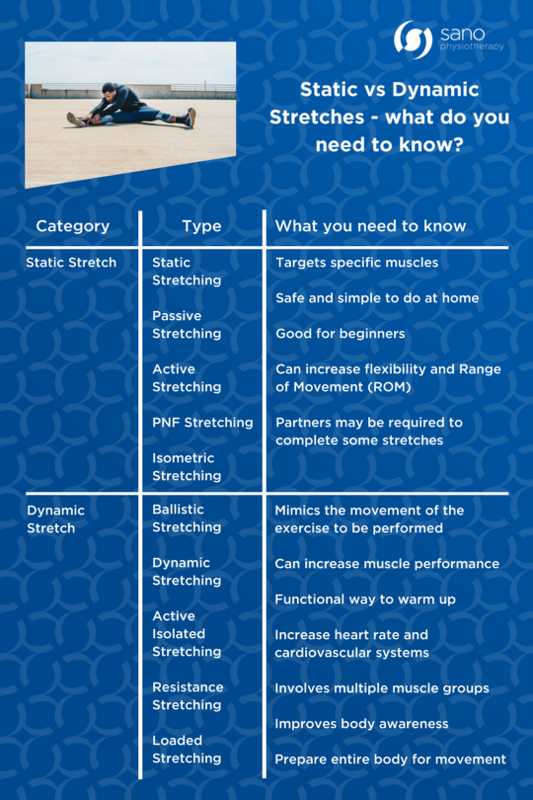 In a previous blog we discussed 10 Things That You Need to Know About Stretching and go through the number of benefits it can have. This time we want to go into a bit more detail on the two categories of stretches available. There are a range of different stretching exercises that you can complete, and quite helpfully they are grouped into either; Static Stretches or Dynamic Stretches. Static Stretches, do exactly what it says on tin, it is a stretch performed without moving. Simply, you get into the stretch position you want, and then hold that stretch for a specific length of time. By holding a certain position, tension in the muscle increases allowing them to stretch. At least 20 seconds is needed as a minimum for muscles to relax and begin to lengthen. On the other hand, Dynamic Stretches are all about movement. Simply, you are moving as you stretch which activates a series of muscle groups rather than a singular muscle. These types of stretches have become more popular since the early noughties throughout sports and are very much the norm to ready athletes for sporting events around the globe. As you can see there are a range of stretches which can be performed both statically and dynamically, however with key specifics between the two. Due to this, you might say they are just as good as each other? Well, you’d be right in thinking that and for one simple reason, to ensure you get the most out of your stretching exercises you need to ensure that you match the right type of stretching to the purpose, or goal that you are trying to achieve. For example, it would be beneficial to complete several dynamic stretches prior to an athletics event, to increase your heart rate and prepare your cardiovascular system for what lay ahead. At the end of the event you would complete a set of static stretches, to bring down your heart rate, prevent joint stiffness and help aid the removal of waste products. On the other hand, if you are going through the early stages of rehabilitation, dynamic stretches may be very risky to do as they can put unwanted pressure on those muscles and joints. Therefore, you must always have in the back of your mind, the goal and purpose of what you are looking to achieve with your stretching exercises. Our YouTube Channel has a number of great videos that feature stretches to relieve Sciatica pain, enhance your running performance and more, so why not subscribe to us now and how stretching could benefit you!